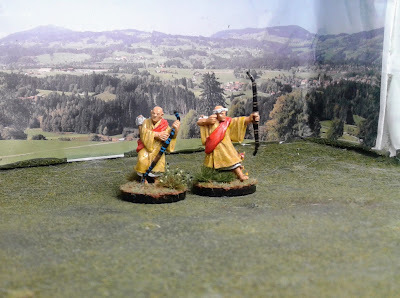 The Sohei have always been some of my favorite figures for Samurai Era gaming. The distinct robes and hoods always stand out well, and the Naginata is one of the more distinct weapons of the time period. 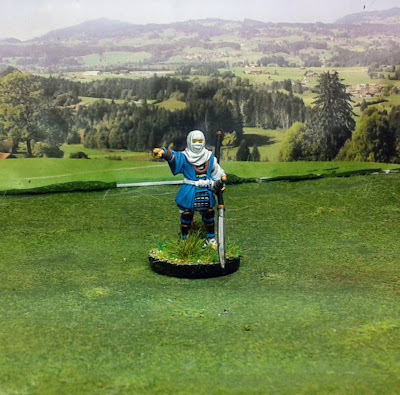 The brief segue into Skirmish gaming with Test of Honour inspired me to tackle a large chunk of the unpainted Samurai on the lead pile. This group is primarily composed of the "Sohei Buntai" Northstar produced for Ronin. 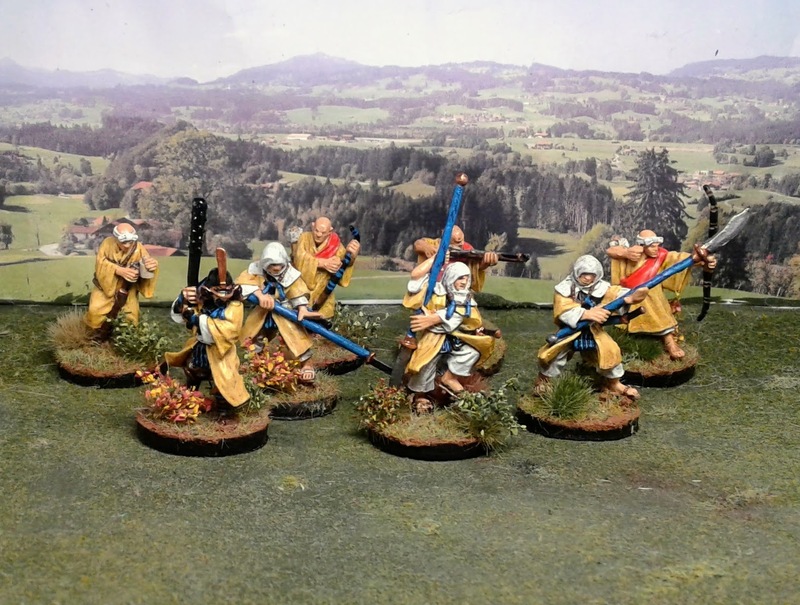 The boxed set comes with a command figure, three monks with Naginata and a pair each of Archers and Handgunners. The command figure is a nice addition as it is a rare sculpt that is not equipped with either a Katana or Naginata. 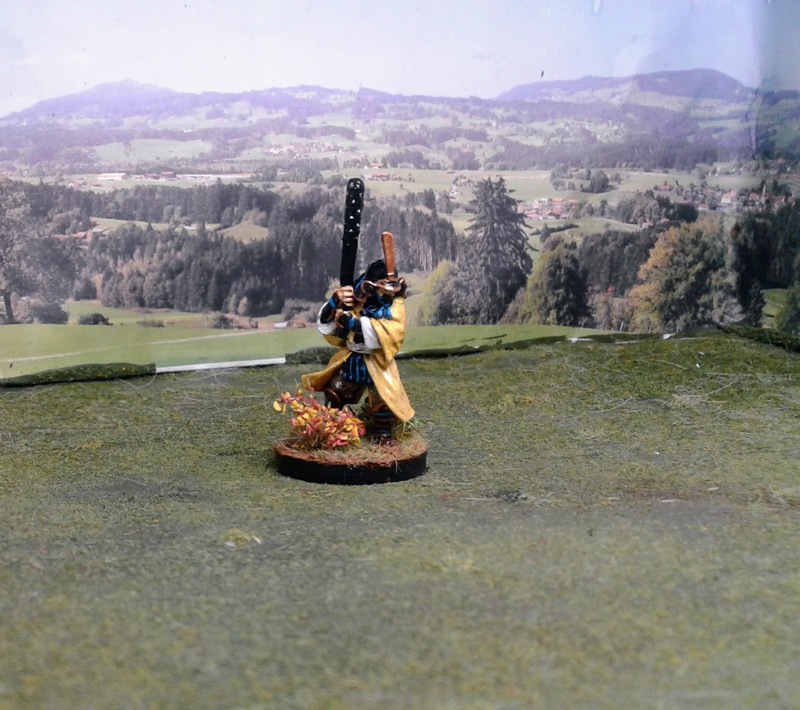 Instead he wields a Kenabo, essentially an Iron studded club. The detail on the armor makes the figure stand out, and he works well as a senior leader. 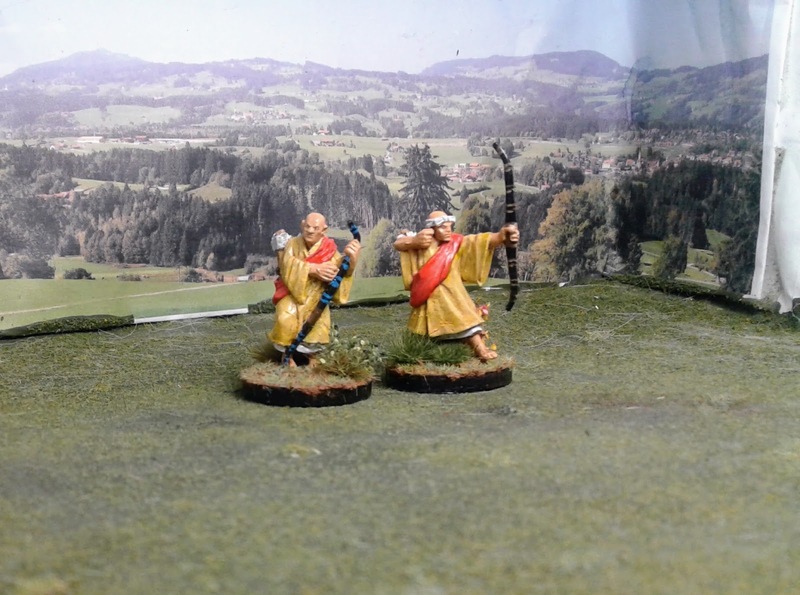 The three warrior monks with Naginata look they came off of the front of Osprey's Japanese Warrior Monks book. 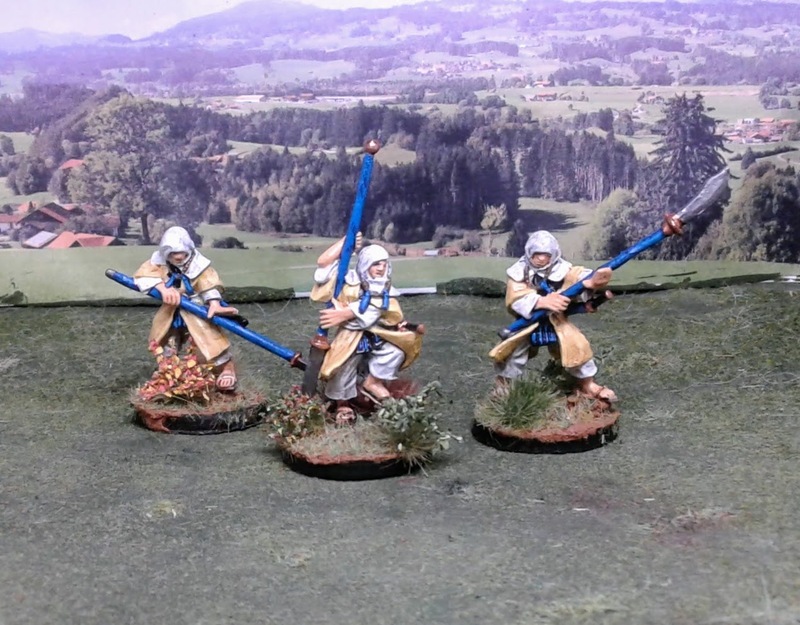 Very dynamic poses with the Naginata combined with full robes and cowls over their armor. I stayed with the yellow, black and blue theme here to tie the group together. 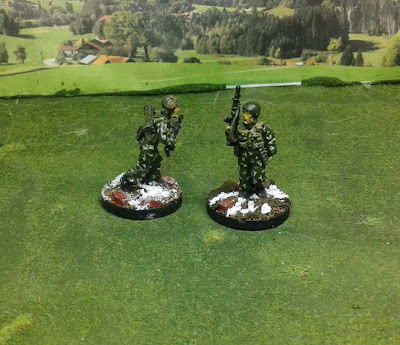 These are well detailed figures and very enjoyable to paint. 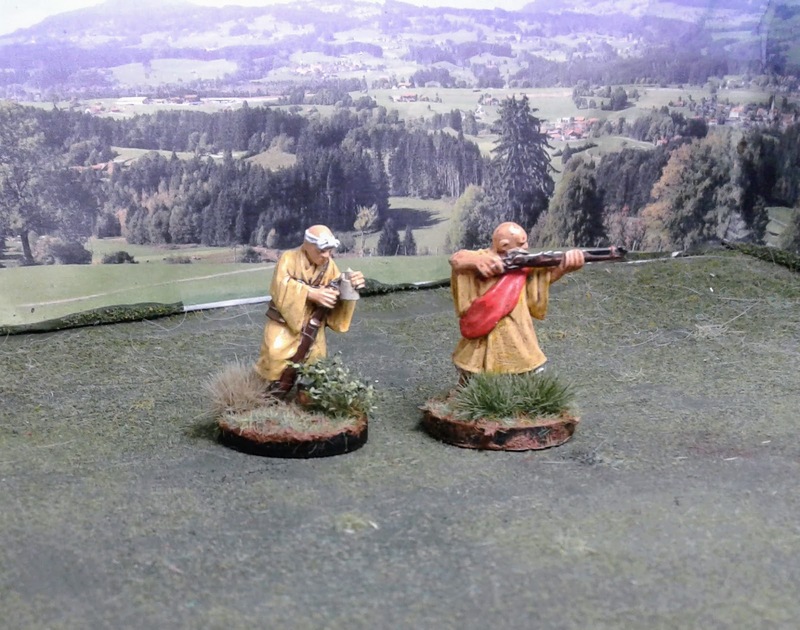 The archer figures are depicted in traditional robes without armor. 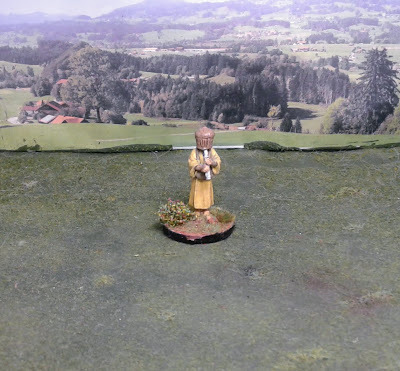 The flowing robes work well, and the figure stringing his bow adds some nice character. My only quibble with these sculpts is the lack of banding on the bows themselves. The detail had to be painted on, which never looks as good as the actual detail from these distinctive bows. 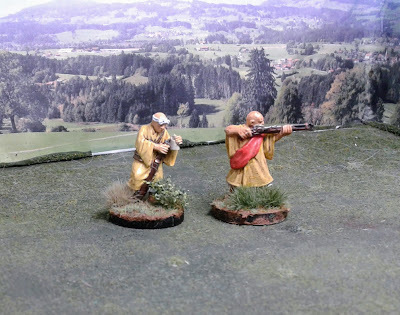 The teppo sculpts are similar to the archers, with one presenting and one preparing his weapon. I went with the same combination of pale yellow and orange highlight. I actually mixed some of the yellow into the orange to try and subdue the hue somewhat, and it seemed to work well overall. 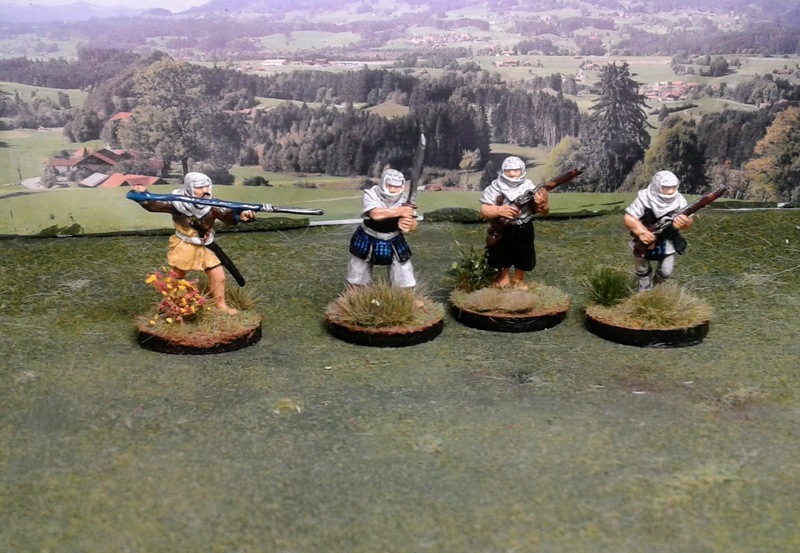 Adding to the warband, are a mix of Ikko-ikki figures from Perry's Samurai line. 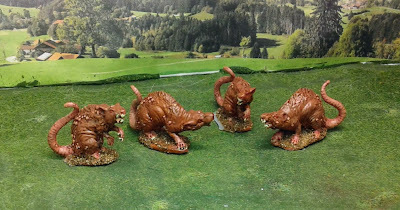 I have several packs of these, so selected a few of the minis with cowls to paint in similar tones to the warband above. I still have a large selection of handgunners and various melee troops to add to the mix as well. Finally, I finished off the last of my Perry civilian pack. This guy will probably serve in the role of musician for a Sohei warband in Test of Honour. I know it is a large diversion from completing my Zorndorf project, but it has been entertaining to expand the collection a little bit and take a bite out of the lead pile. I still have a few dozen more Samurai era figures to finish, so they are promising to dominate my April output. Never fear however, as there are three regiments of Russian Dragoons waiting in the wings. Thanks. I just wish I had the skill to write the Kanji to do proper banners. Thanks. I kept putting off painting this group, but I wanted to pick them up as soon as I saw them released for Ronin. Awesome work! I love the Ronin boxes. 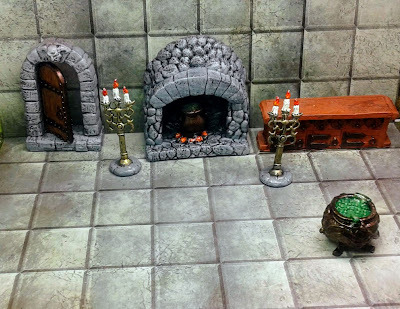 Painted Koryu and Bandits Buntai and the're great also. Thanks. 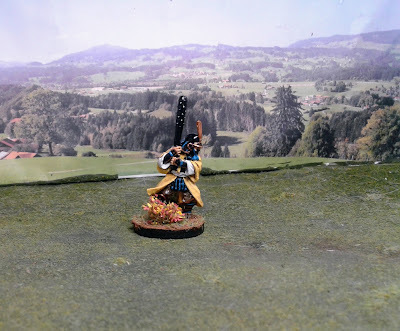 I have been thinking of picking up the Koryu box just for the Swordmaster model. Variety is the spice of life, and this fine diversion into Renaissance Japan should make painting the Russians feel fresher!